The European Union seems incapable of undertaking economic reforms and defining its place in the world. Public apathy towards the EU is also increasing, as citizens feel isolated from the institutions in Brussels and see no way to influence European level decisions. Taking a diagnosis and cure approach to the EU’s difficulties, Simon Hix tackles these problems with distinct clarity and open-mindedness. What the EU needs, Hix contends, is more open political competition. This would promote policy innovation, foster coalitions across the institutions, provide incentives for the media to cover developments in Brussels, and enable citizens to identify who governs in the EU and to take sides in policy debates. The EU is ready for this new challenge. The institutional reforms since the 1980s have transformed the EU into a more competitive polity, and political battles and coalitions are developing inside and between the European Parliament, the Council, and the Commission. This emerging politics should be more central to the Brussels policy process, with clearer coalitions and identifiable winners and losers, at least in the short term. The risks are low because the EU has multiple checks-and-balances. Yet, the potential benefits are high, as more open politics could enable the EU to overcome policy gridlock, rebuild public support, and reduce the democratic deficit. This indispensable book will be of great interest to students of the European politics, scholars, policy makers and anyone concerned with the future of the European Union. Simon Hix is a British political scientist and Harold Laski Professor of Political Science at the London School of Economics and Political Science. "An exciting, rigorous and compelling book. The fix of Hix makes much more sense than the Panglossians who want to do nothing or others who argue that all the EU's problems will be resolved with better PR and more procedural reforms." "Hix's research makes a convincing case that left-right divisions have deeply penetrated policymaking in the parliament, the council and the commission. Missing is a contest for political power and policymaking between rival groups and policies, with clear winners and losers and a visible link between voting, leadership and outcome." "[A] short and highly readable book, which began life as a series of policy papers written for the UK government." "Simon Hix's analysis is as authoritative as his case for reform is compelling. Reasoned, rigorous and riveting, this book is a must-read for all who care about the future of the European Union." "An exceptionally clear and provocative argument in favour of 'limited democratic politics' in the EU, showing precisely how it could be applied to the 2009 European elections." 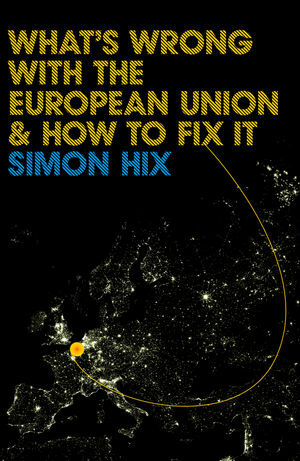 "Simon Hix is among the leading political analysts of the European Union of his generation. Here he offers a critical yet balanced analysis of Europe's 'democratic deficit', linked to pragmatic proposals for reform. Whether one agrees or not, this slim and readable volume is required reading for anyone seriously concerned about the constitutional future and political legitimacy of Europe."